Mathews’ Rockery was one of the earliest developments in the Garden. It is named in honour of the first curator of Kirstenbosch, J.W. Mathews, who was responsible for the elaborate and imaginative construction work. The Rockery is constructed of local sandstone and was built in the 1920s, the days before front-end loaders and other earth-moving equipment. The rocks and stones were moved and placed by man- and mule-power. The Rockery is an intricate maze of small pathways in amongst which weird and wonderful xerophytic plants from the arid regions of South Africa are planted. You will see many kinds of Aloe – at their best in winter (May-July) when they are in flower, Euphorbia – including two very big old Euphorbia ingens (tree euphorbias) planted in 1922, and Crassula, which come in many shapes and sizes. Joseph William Mathews was born in Cheshire in the United Kingdom and trained at the Royal Botanic Gardens, Kew. He moved to Cape Town and for 20 years was a nurseryman and florist and is credited as being the founder of floriculture in South Africa. 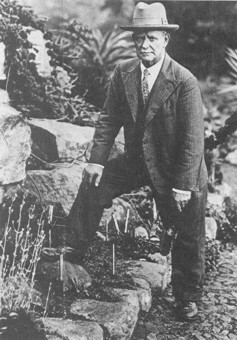 He was curator of Kirstenbosch from 1913 until 1936. He was one of the first horticulturists to encourage the use of indigenous plants. He collected some new species, wrote many articles on growing indigenous plants and was the gardening correspondent of the Cape Argus. Go to our plant information website to find out more about the plants.